Architecturally designed and delightfully comfortable, our three AA Highly Recommended Crab Apple Cottages are set on the edge of a pristine wilderness, the Dargle Valley Conservancy. Each thatched, self-catering cottage has a different character whilst being furnished with every comfort including underfloor heating to keep you snug. The bedroom has a queen-sized bed and there is an antique cast iron Victorian tub and shower in the en-suite bathroom. The spacious, open plan living area, with sleeper couch for children, leads onto a sun deck. Starred Robin Cottage has an additional loft with two single beds. 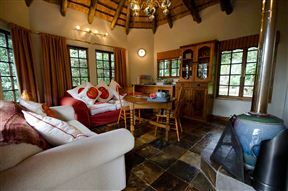 Starred Robin and Wood Owl cottages have multi-fuel cast-iron stoves as fireplaces, while Crowned Eagle cottage has a large Spanish-style fireplace. As enthusiastic supporters of local living, the Booysen’s have used local suppliers to furnish the cottages. Our delicious spring water, from the taps, is drinkable. There is an electronic safe available in each cottage. A laundry service and a housekeeper are available if required. Starred Robin Cottage is a quaint, English-style country cottage, decorated with oak furniture and a cream and white palette. The deck is garlanded with rambling roses and overlooks a fairy ring of Silver Birch trees and the rolling lawn leads down into the forest’s stream. The cottage’s namesake, a pair of Starred Robins, are resident. This shy insect eater is notoriously difficult to spot. Another pair nest at Wood Owl cottage. You are also likely to see the troop of Samango monkeys who regularly raid the lemon tree. Children will be delighted to find the playground near this cottage, it includes a jungle gym and swing. 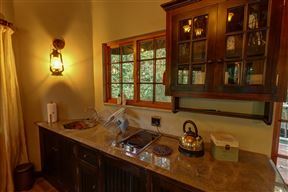 Tucked into the forest, Crowned Eagle Cottage is both modern and warm decorated in rich reds and oranges. The porcelain lamp fitting was restored by Helen and her father. The wooden deck provides a breath-taking view over the forest. This is the territory of a pair of Crowned Eagles – the nest has been in the same spot for at least 70 years and is visible from the cottage. A family of Dassies (Rock Hyrax) have made their home beneath the deck. Follow a secret path down to a stream in the forest for a moment of absolute solitude. 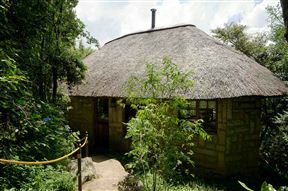 An African Elegance vibe was instilled in Wood Owl Cottage. Mohair curtains, wicker chairs and dark wood furniture create luxurious warmth and elegance along with the bespoke four poster bed. This cottage offers many pleasures – the deck overlooks the forest, the doors open onto the heated pool and there is a fragrant rose garden just around the corner. 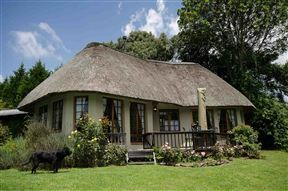 Fireplace, Swimming Pool,Wedding Venues, Wi-Fi and Braai Facilities, Laundry Facilities – Pets permitted by arrangement.